Super Zix II is a brew that includes zinc sulfate, b-6, saw palmetto, beta sitosterol, unsaturated fatty acids (linolenic acid and oleic acid), polysorbate 80 and ethyl alcohol. There is some good evidence to suggest that all of these compounds are helpful for both male and female pattern hair loss. However evidence does not constitute proof in the eyes of the FDA. There are several studies showing zinc and b-6 to be 5AR inhibitors. Topical saw palmetto was effective at regrowing hair in at least one study. Beta sitosterol is found in saw palmetto but at only a 1% concentration but it is believed to be the active ingredient by many. Therefore the additon of this compound should maximize any benefit from the saw palmetto. Polysorbate 80 (used as an emulsifier and penetrant) was once sold many years ago as a treatment for hair loss as well. It was marketed by the name of "The Helsinki Formula". There has been at least one study demonstrating the effectiveness of this compound. However again Polysorbate 80 is another ingredient not "proven" to regrow hair. But since we need an emulsifier anyway why not use one that is at least suspected of being helpful in and of itself? To read journal articles supporting these ingredients click on the "Library" link on the home page. Unfortunately I could not find a retail source for the beta sitosterol powder. I purchased a large supply and manufactured an extract/concentrate that contains saw palmetto as well as beta sitosterol. Therefore if you wish to give this formula a try you will have to purchase these ingredients from me. 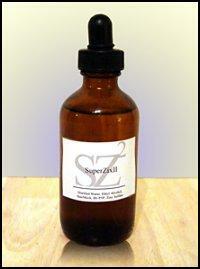 The cost from me for all the ingredients to make Super Zix II is $54.95 for a one year supply. I've also added some vegetable oils to the extract/concentrate that are rich in linolenic and oleic acid. We have some studies suggestiong that these two substances are also 5AR inhibitors. 5AR is the precursor of DHT, the hormone responsible for causing hair loss. See the "Library" link on the home page for journal abstracts. Since I am now manufacturing the saw palmetto/beta sitosterol extract myself I am able to offer all the ingredients for less money than they would be if you purchased all the ingredients yourself. Click here to purchase Super Zix II supplies. 1 220 mg zinc sulfate capsule. (Each 220mg zinc sulfate capsule actually only contains 50mg of elemental zinc). You gently open the capsule and add the contents to the mix. 3 50mg b-6 capsules.You gently open the capsule and add the contents to the mix. 3 1/2 oz. of distilled water. (Not spring water but distilled water). You can purchase at your local supermarket. It is very cheap. 1/2 oz of Ethyl Alcohol 70% available in any pharmacy. A small amount of polysorbate 80. 10 mls of liquid beta sitosterol/saw palametto (Hair MUCK) extract and concentrate. Add 3 1/2 oz of distilled water to 1/2 oz of ethyl alcohol to your large 8 ounce container. Then add the zinc, b-6 and 10 mls of the liquid beta sitosterol/saw palametto extract and concentrate (Hair Muck). Then add 20 drops of the polysorbate 80. Close the container and shake well. Then pour the contents into both 2 ounce minoxidl (Rogaine) containers. Make sure you refrigerate your bottle of liquid beta sitosterol/saw palametto extract after you've opened it. You should also refrigerate your Super Zix II formula as well. But when necessary it will survive for a couple of weeks without refrigeration. The ethyl alcohol will serve as a penetrant (helps to get the ingredients into the follicles) and a preservative (prevent bacterial growth) but at only a concentration of 10% you could still have a bacterial problem (usually a 20% concentration is required to prevent bacterial contamination). Like I said before I recommend you store your Super Zix formula in the refrigerator to prevent any possible bacterial contamination. To obtain the ingredients to make your own Super Zix II, return to the home page and click on "Places To Purchase Ingredients". Using an eyedropper you apply a drop to an area of your scalp with one hand and then immediately rub it in a bit with the other. This will prevent the Super Zix from running off your scalp. Proceed in this fashion until you have covered all the areas you want to treat. You do this procedure twice per day. You do not need to over apply the Super Zix formula. It will serve no additional benefit in my humble opinion. After 5 minutes you can comb, style, blow dry or do whatever you want to your hair. If applying after showering first gently towel dry your hair...apply the super zix...wait 5 minutes and then proceed with your normal styling routine. Remember this formula is not proven to regrow hair and this entire website represents nothing more than my opinion. Also the best success stories seem to come from those individuals that use only the zix formulas and no other topical treatments for hair loss. So if you are presently using something else and you feel you are benefitting from it, the zix formulas may not be such a good idea for you. If you are using minoxidil you may want to check out "Minomuck" instead. I have a formula that you can add directly into your minoxidil that studies suggest will be helpful for hair loss sufferers. Finally anyone seriously interested in keeping or possibly regrowing their lost hair should utilize Nizoral shampoo. The active ingredient in Nizoral is ketoconazole. It's pretty much a "done deal" in my opinion that this does help people keep and even regrow some of their lost hair to a degree. It is relatively inexpensive. You can locate it in the medicated shampoo section of any pharmacy. Even Walmart sells it. It is recommended that you use it twice per week. Some people use it everyday but this may be more than your scalp can tolerate.